The term minimum viable product (MVP) refers to the concept of building a product with just enough functionality to gain traction with early adopting users. When following the MVP model, more complex features are developed only after carefully considering in-depth feedback from the product’s initial users, often called alpha testers. 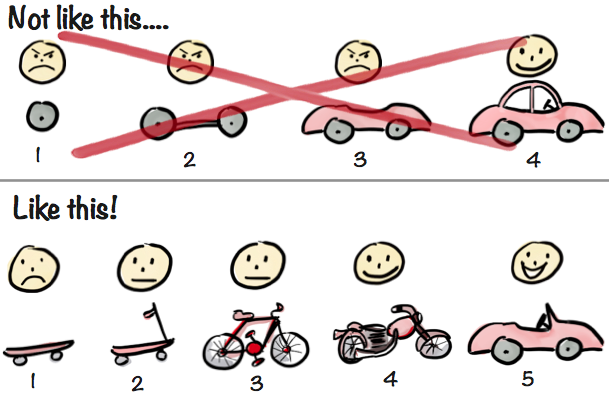 The concept of MVP first appeared in Eric Ries’ Silicon Vally Bible, The Lean Start-Up. Since then, the MVP process has become canon for product teams at many startups across SaaS, eCommerce, consumer technology, wearables and a host of other industries. As illustrated by this famous diagram by Henrik Kniberg, a core component of MVP is releasing a product with real utility in the earliest stages of a start-up and then scaling functionality. When applying the concept of MVP to personalization, it becomes easier to understand the advantages of a product that was built from the ground-up as a unified platform. Baseline product-market fit for a personalization stack includes a platform that can personalize content and layout, provide recommendations, automate testing and deploy behavioral messages. At Dynamic Yield, we’re proud to have built an end-to-end solution as our MVP that we’ve continually added market-leading functionality to over the years. To continually follow the exciting development of our product, please head over to our product blog!